Java has been the primary language for Android app development until Kotlin came into existence. After the advent of Kotlin, it would be unfair to say ‘Java is the only or rather the best choice for development’. With the growing technology advancements, several JVM languages have impressed developers, and it could be said that Kotlin is leading in this crowd of programming languages. Why Should ‘Kotlin’ be every Developer’s Choice? Developers who have already made a switch from Java to Kotlin to program applications would know how it is better than Java. Kotlin app development has emerged as a growing choice of companies wanting to build unique applications. 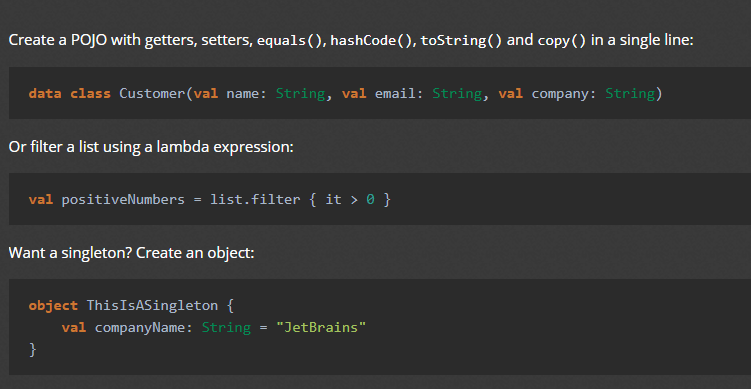 Developed by JetBrains, this programming language is pragmatic and concise, which makes coding a satisfying experience for developers. Kotlin language is 100% interoperable with Java, which means developers can continue their existing Java-based projects with Kotlin. This language also offers flexibility to developers by allowing them to write using any framework. Kotlin is quite a developer-friendly language. The syntax of this language is not wired to any developer; in fact, it is comfortable for any person from the OOP domain to code using Kotlin. There are minor differences from Java – for example ‘val var’ declarations. When compared with Java, Kotlin language requires fewer lines of coding to implement the same function. To give a rough estimate of how far it can reduce coding effort, it could be said that Kotlin requires 20% less coding than Java. Programmers do not need to spend a lot of time to learn Kotlin. Being quite similar to Java with intuitive and clean syntax, this language can be learnt by investing a few hours. Kotlin has a gentle learning curve, especially for Java developers. As mentioned above, Kotlin requires less coding. This fact is clearer when seen from the perspective of minimizing the boilerplate code. Kotlin is not only easy, but also safe to use. Given this fact, it is worth mentioning that developers could avoid errors of NullPointExceptions using Kotlin. 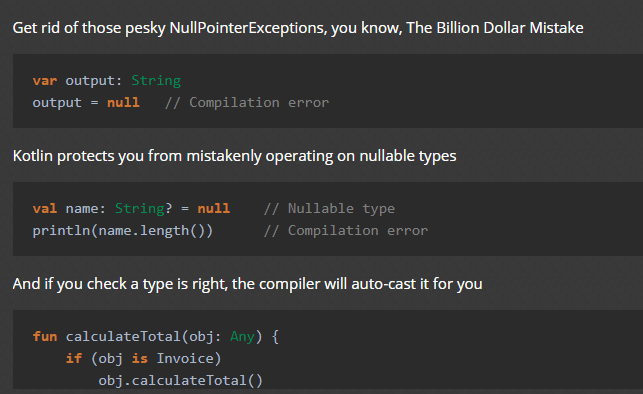 Developers need not worry about mistakes of operating on nullable types with this language. Kotlin’s compiler auto casts mistakes, even if you have checked a type as right. Developers also avoid entire classes of errors such as null pointer exceptions with Kotlin. Developers need not spend any extra money to start using Kotlin programming language. This is an open source language and developers can simply start using it through Java-to-Kotlin converter tool that transforms existing Java files into Kotlin. The tool enables converting the complex code to a simpler form without compromising on time and effort. Kotlin language is tool-friendly, i.e. developers can choose any Java-based integrated development environment (IDE) or build from the command line. This feature is attractive for any developers to start using Kotlin, without any extra efforts. 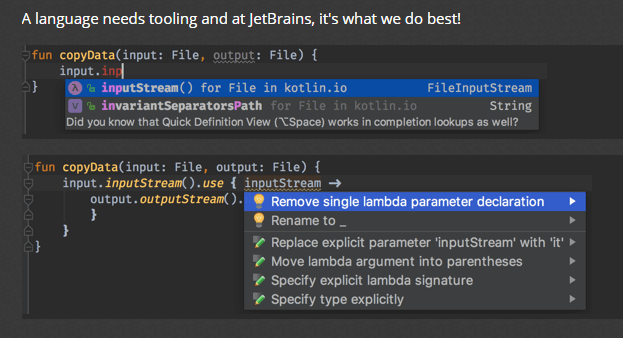 Kotlin – a programming language developed by JetBrains comes with top-rated Android Studio Support. Hidden Brains, a leading Android app development company believes that Kotlin could take Android app development a step ahead. Easy to use, simple to learn and glitch-free security from exceptions are major reasons responsible for replacing our traditional programming language with Kotlin. If you are in search of app development using Kotlin programming language, request for a free quote now!